Likewise at Maison this year, many companies were doing their part to “democratize” home styles by bringing well-designed and innovative products to the masses. Here are a few of the hot trends and fabulous finds I discovered at the show. One of Jim Thompson’s Turkish-inspired prints in terracotta paired with turquoise blue. In the Jim Thompson showroom, artist Richard Smith introduced his latest No. 9 collection, inspired by Turkish motifs. 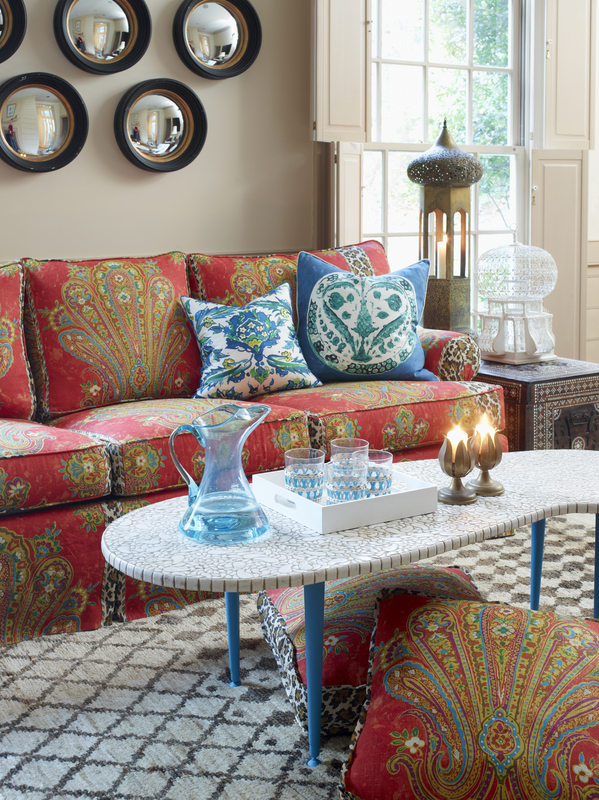 Smith’s Grand Paisley fabric pairs a wheat-colored linen foreground with forsythia, light pink, chartreuse and turquoise-blue accents. A perfect spring bouquet! Gray is still popular this season. In shades ranging from light dove to taupe to dark charcoal, it provides a neutral canvas upon which many vibrant colors can be paired. A profusion of pink permeated the show this year, from light rose to warm coral and deep mauve. The chromo-meter was also turned high with bright shades from forsythia yellow to Chartreuse green. Fabulous shades of blue were also omnipresent. 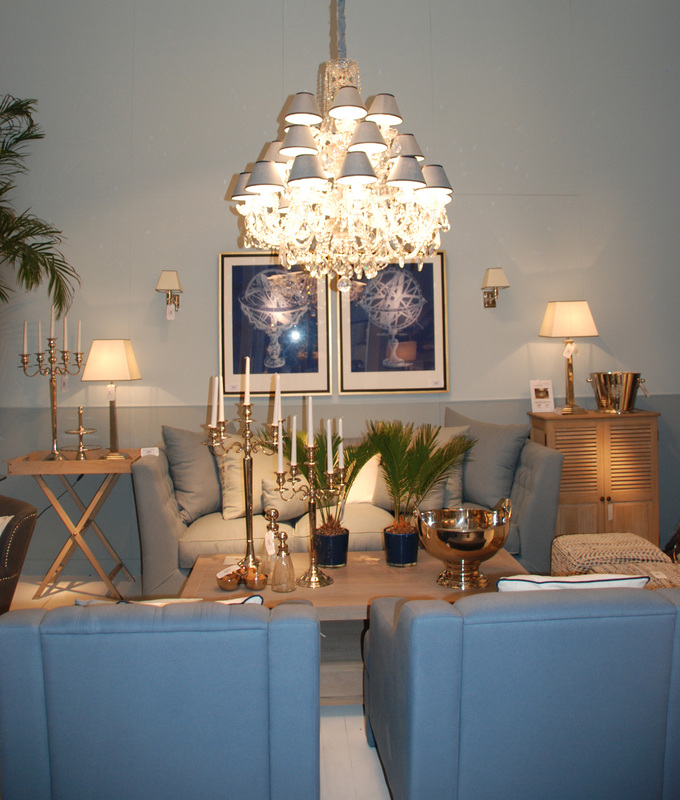 Below, Belgian company Charrell combined a serene blue linen sofa and chairs with lightly distressed wood furniture and a stunning crystal chandelier. A vignette by Charrell combines a blue linen sofa and blue dining chairs. 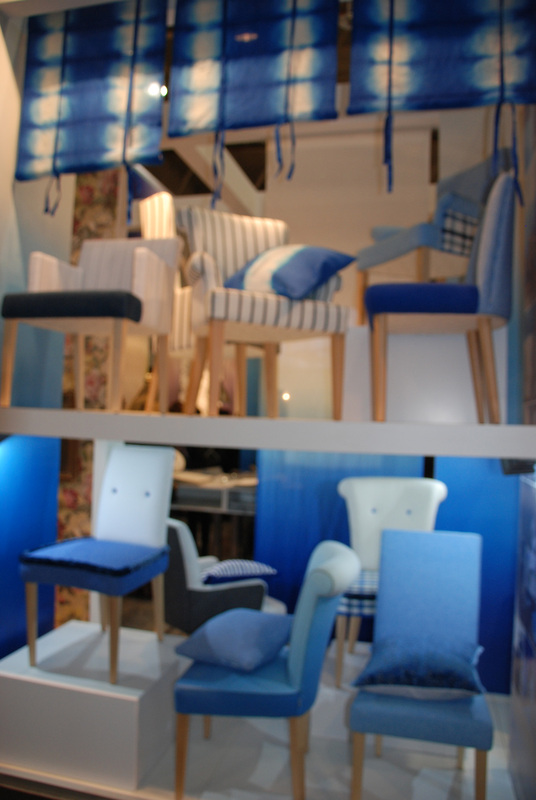 London’s Designers Guild displayed an alcove of chairs upholstered in all shades of blue, from indigo to sky blue. Shades of blue: Designers Guild’s chair collection. 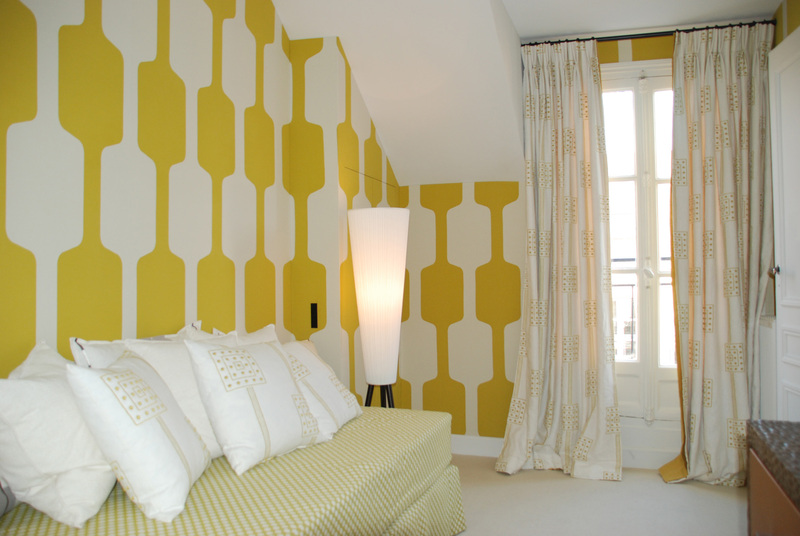 And a guest room by Pierre Frey was enveloped in a bold, modern graphic fabric that covered the walls in bold forsythia and ivory. Upholstered walls by Pierre Frey. Theresienthal Crystal introduced a new collection this year called Amundo, with designs based on the Asian temples of Angkor Wat. 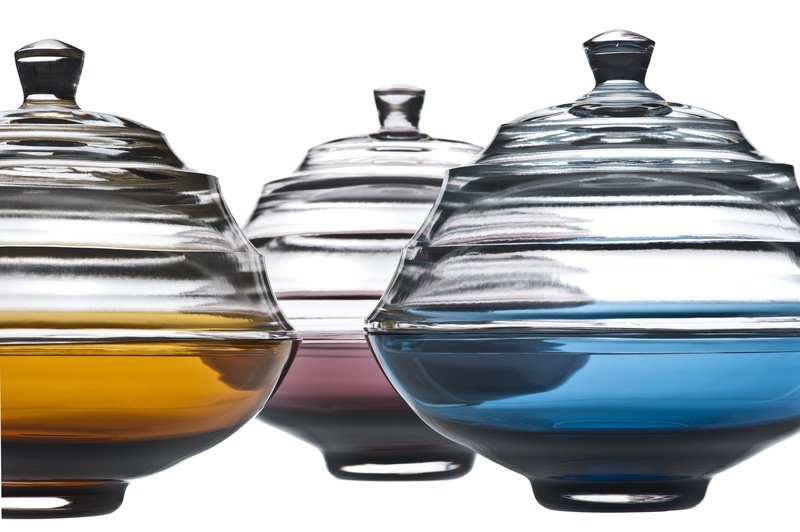 Each piece can serve as a vase, a tea light, a candle holder or a centerpiece bowl. The colors of amber, indigo and plum impart a sense of serenity. Versatile new vases by Theresienthal were inspired by temples of Angkor Wat. One of the most innovative lamps I found at the show is from a small French company called Verveine Menthe. Drum-shaped lampshades in its nature-inspired collection come in a variety of vibrant colors and display a whimsical cut-out where a faux canary is perched. 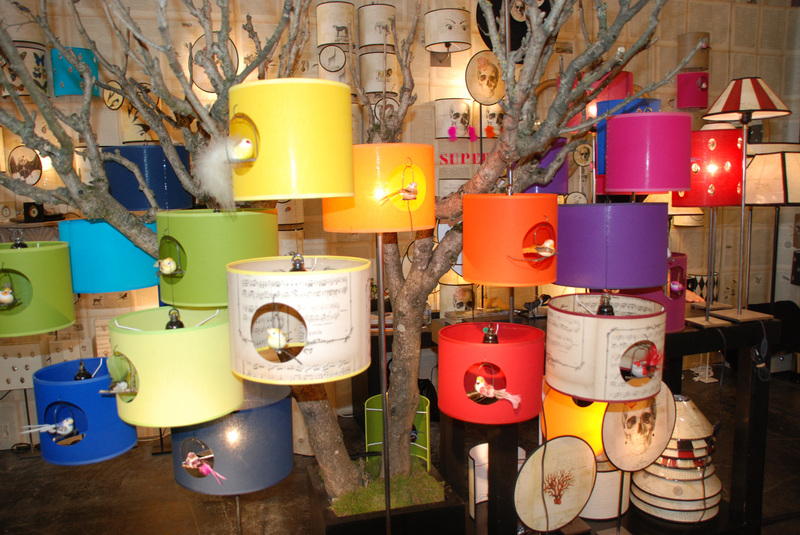 Vibrantly colored lamp shades by Verveine Menthe. As Jules Renard once said, “add three letters to Paris and your have “Paradise. ” It is so true that Paris, the capital of decorative arts, has the ability to inspire great creativity in all of us. of Art, where she was awarded a Fellowship.